“A young man,” the saying goes, “plants turnips. An old man plants trees.” As I get on in my years (I’m pushing 60), the idea of leaving behind a legacy becomes more important. Few legacies last longer and affect more people than trees. If you are lucky enough to have a woodlot, you probably have an appreciation for its benefits. It may provide recreation and wildlife habitat, firewood and even timber for building projects. It may be a place to hunt, fish or seek out solitude. Chances are different members of your family appreciate the woodlot in different ways. Fortunately, most uses of forest land are compatible, and the woods can be managed to provide these benefits on an ongoing basis. More than a century before the term “sustainable forest management” became popular, the Menominee Indian tribe managed its forest for the long term. The head forester once explained it to me this way, “Every decision we make, we ask ourselves how it will affect those who follow for seven generations.” The Menominee tribe has managed the same land for over 150 years and it continues to serve as a thriving forest while providing lumber and employment. Harvesting what the land has to offer does not have to diminish it. In fact, well managed land can provide resources and improve its overall quality, health and productivity. And you don’t need a degree in forestry to make it happen. The first step is determining just what you want from your forest. The good news is, you can have it all! From a sawyer’s perspective, I like to see straight, high quality trees. Sure, I’m partial to walnut, but the key to sustainable management of a healthy forest requires diversity. This gives the best protection against diseases, since you can plant or encourage the best mixture of tree species for the different soil and topographic features on your land. This also provides better wildlife habitat and diversifies your “portfolio”, so you can usually optimize your lumber sales for the species which are in high demand at the time. Plus, it is just more pleasant. Uneven age management helps create a mixture of trees similar to that found in nature. 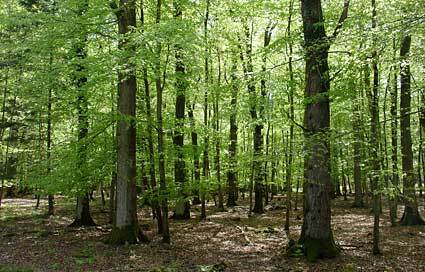 For example, clearing ½ to 1 acre encourages shade intolerant trees, such as walnut, cherry and sycamore. Selectively removing trees in a more disperse pattern encourages the shade tolerant oak, hickory and maple trees to thrive. Trees need some competition from other trees to grow straight. Open grown trees tend to be crooked with low branches, which is fine if you like plenty of shade or are looking for nut production. But if your aim is to have a steady supply of firewood and quality lumber (either for your own portable sawmill or to sell), the forest-grown tree is the way to go. In order to succeed, these trees must grow straight upward toward the sunlight as fast, or faster, than the ones around them. After 20 to 30 years, you will be able to evaluate, which trees are “keepers” and thin out the less desirable ones. The rule of thumb is to thin out the trees so there is about half the crown diameter of open sky between the best trees and their nearest neighbors of the same height or taller. Your trees do not need to be perfectly spaced. In fact, a little variety is good. In a year or two, the tree canopy will fill the open areas, but you probably won’t need to thin them again. Given a chance, trees will thrive in the areas which suit them best. For example, white oak does well on west-facing slopes, which tend to be drier. Unfortunately, ours were logged-out fifty years ago because of their value for whiskey barrels. To compensate for this, we thinned out many of the other species to give the best remaining white oaks a chance to regenerate. There are now thousands of white oak seedlings that will eventually reestablish a more natural balance of trees which also includes hickory, dogwood, cherry and other species of oaks mixed in. Regeneration after a harvest is generally best taken care of by the trees remaining, as long as there is a good stock of acceptable quality. When your stock is lacking, it is time to reach for the digging bar and start planting. Walnut is a good example. It has been pretty much logged out because of its high value. Those remaining are poor quality trees, which would not be a good seed source. Instead, we’ve planted trees from superior genetic stock purchased from the Conservation Department in our area. So how much can you harvest sustainably? According to “The Woodlot Management Handbook”, the rule of thumb for hardwoods is 1/2 cord of firewood per acre on good hardwood sites. If the woodlot is overstocked with stunted trees, you might cut two or three times that amount, until you bring it back into balance. Once a healthy forest is established, you will still be able to harvest more wood, because you have created a vigorous forest. Any woodlot, whether two acres or two thousand acres, is worth caring for. Your county extension agent will know the forest types in your area and can assist you in coming up with a management plan, which will provide you with the benefits you want while protecting the land so it can be passed on to future generations. An excellent reference is “The Woodlot Management Handbook” by Stewart Hills and Peter Mitchell, published by Firefly books. Two other favorites of mine are “Positive Impact Forestry”, by Thom J. McEvoy (2004, Island Press) and “Wild Logging” by Bryan Foster. (2002, Mountain Press Publishing Company) which are both thoughtful and easy to read references. Sawmill and Woodlot Management magazine has excellent articles on woodlot management, including information on how to assess your timber resources, and how to develop a management plan to reflect your desires for your woodlot. There are also regional forestry magazines, such as Alabama Treasured Forests, Ohio Woodlands Journal and Green Horizons. On the Web, the Norwood Connect and the Forestry Forum have forums where you can post questions and share experiences with other woodlot managers and foresters. Our mobile sawmill is a valuable tool for forest management. 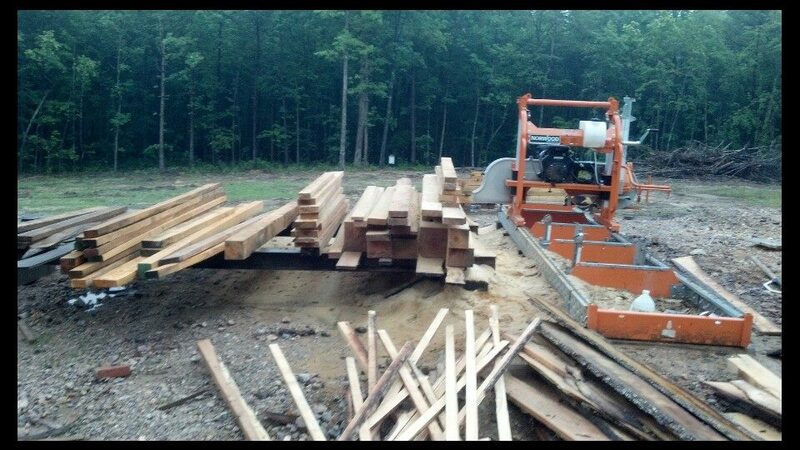 It lets us convert low quality trees into good lumber to sell and for use on our tree farm. It is a great feeling to mill these “trash” trees into usable lumber. As the best trees age, they too, will be harvested. By then, hundreds, if not thousands of their offspring will be ready to take their place. Even if it takes seven generations to rebuild the forest, that is scarcely a moment in time to the forest, and some of the trees I am planting now may still be standing. Even if no one remembers the work I’m doing now, my great, great, great, great, great grandchildren might climb in its branches and enjoy its shade. No one will remember the turnips. Have any other ideas or useful tips for effectively managing your forest? We’d be very glad to hear and add them to the comments below. Thank you for an excellent ‘article’. I found it a ‘good read’, accessible, yet fully informed. Your work on your own land is to be highly commended, and if I very get to your side of ‘The Pond’ I should love to visit, but that’s unlikely (I’m a year ahead of you in the age stakes and in fluctuating health & poverty!). Thank you again for a fantastic read, which, if you will permit, I will refer to others as source material. Well done, and good luck with your forests (and descendants). I didn’t know how important diversity was for maintaining a healthy forest. I didn’t realize that planting different types of trees would provide better home for wildlife as well as diversifying your tree portfolio. The fact that some trees can handle shade while others can’t also shows that growing trees isn’t as easy as it initially seems. Thanks for the information!